It is with the love of the Creator and great delight that I step forward to greet you today. My love is embedded within your being always, supporting and nurturing you with every moment of your ascension. For many of you I have been by your side since your first activation of ascension within your being. As a world teacher alongside Master Jesus, it is my purpose to guide you as to the will of the Creator for ascension on the Earth. As you are aware you are existing in most amazing and exciting times, where shifts are occurring every moment within your reality and the united reality of the Earth. These shifts will only develop, enhance and accelerate over the coming years as we all draw ever closer to uniting as one with each other and the Creator. There is so much fun, enjoyment and miraculous experiences coming into your reality at this moment and in the future of the Earth. Please know that the Earth will remain with you through all these shifts until you are ready to change your dimensional energy and begin a new progression. The Earth will support you as we move through December and into 2013, please know that you are safe, protected and loved by the Creator, please know that everything is perfect at this moment on the Earth and within your being. Over the next few months and even year you and the Earth will experience a fall, a loss, almost a death or the feeling that the end is here. I do not say this to bring fear into your sacred energy but to make you aware, it is the death, loss, fall or end of old energies or of reality as you know it. It is an energetic death or loss rather than a physical. You are moving through these shifts now, you are losing many parts of your being and the way that you identify with yourself but you understand and recognise that this is necessary for you to achieve a greater state of bliss on the Earth. It is important to remember that whether you are on the Earth or the inner planes, the experience of letting go of attachments and unneeded energies are very similar. On the inner planes we are watching you all release so much, we are also dissolving illusions and becoming more united on the inner planes. We are working upon advanced processes of dissolving self, even dissolving the separation of our being as a soul or soul group. On the inner planes great intention is being placed upon our soul groups, we are being asked to exist as our soul groups more and more, we are forming a tremendous sense of unity. Everyone is achieving unity at this moment, the Creator is asking us to unite our energy so that our vibrations become similar and quicker therefore we can be simultaneously lifted up to the light, supporting each other through the process of embodying and embedded greater love which is pouring from the Creator. It could be compared to a wedding on the Earth, everyone is gathering together in unison to honour the love of a couple, but for us the entire universe is gathering together to honour the love of the Creator, the love of a couple (meaning the partnership of all of us united in a most beautiful relationship of oneness with the Creator.) There is always a great celebration at a wedding and so our celebration will be the love, bliss and peace that are experienced in various degrees by each person. One of the main insights that I wish to share with you is that this time has been long awaited and is a most beautifully glorious time but it is not the end, nor is it the beginning, it is simply a transition of light, consciousness and vibration within your being and upon the Earth. There will be many more shifts such as this which will be even more magnificent and greater than the current shift that is occurring, which will carry and propel you forward. The shifts will become easier because you are being asked to let go of so much of the past at this time that in future shifts you will be no longer existing in or holding onto. You will be existing in your present making the transitions smoother and less challenging. The reason for this time of 2012 being so anticipated is because it is akin to the final transition within and holding onto old energies, egos and thought patterns. It is a great release of the past; there will be nothing in the future experienced like this upon the Earth. You will continue to release and let go of old energies beyond this time but it will not have such importance or influence upon your being as it does now. I wish to say that if you are experiencing bliss at this time, enjoy it because it will only enhance and magnify, if you are experiencing challenges and the process of release at this time then enjoy it because you will never feel it so strongly again as you do now, because beyond this point you will become far more centred and so emotions and thoughts will no longer have an intense influence upon your being. It is my view that whatever you are experiencing in your reality is a process of release and letting go. If you are experiencing pain, fear, anger, insecurity and so forth you are recognising and releasing these now in order to free yourself. If you are experiencing joy, abundance, bliss and happiness you are still releasing because you are allowing these aspects of yourself to flow freely from your being therefore creating freedom. This time is most glorious and I hope that you are able to thank yourself for choosing to be on the Earth now with the most wonderful gift of experiencing. An additional purpose of coming forward to you today was to share ideas, insights or advice about preparing yourself for this time of growth, accepting tremendous energies, freedom, dissolving separation, greater unity, acceptance of love and the release of the past, which is often entitled ascension. Please remember that these are only thoughts from my heart which I feel may be of benefit at this time. 1. Relaxation for the Mind - There is a need to give more time to relaxing the mind. With so many shifts occurring within and around your being, the mind can go wild trying to understand and interpret everything that is happening. The mind may become confused or begin to focus upon energies that are being released which need to be let go of by the mind quickly. This is not the time for the mind to be working or analysing, it is a time for the mind to take more periods of relaxation and to rest within the heart. This can be achieved through meditation, by imagining the mind as a light, energy ball or object melting and drifting to rest in the heart chakra. If the heart chakra is not completely open then this may feel very neutral and almost empty,but this is fine as with greater focus on the heart chakra a more blissful vibration will be experienced. So please do not try to think too much and by allowing times of peace you are creating a greater sensitivity to what is occurring around and within your being. 2. Attune Your Crystals - Many of you have crystals in your reality or homes which you may use on a regular basis or you may not. 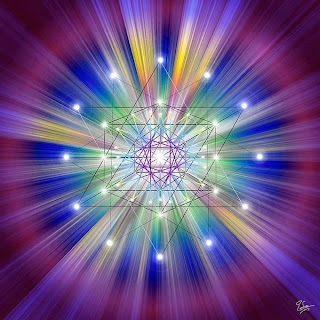 It is my belief that now is the time to cleanse your crystals and to ask for Archangel Metatron to attune your crystals to the channel of light, love and consciousness that is ever flowing from the Creator's heart chakra onto the Earth. Ask Archangel Metatron to ensure that your crystals receive all the new energies being anchored and flowing from the Creator's heart chakra so that each crystal may vibrate, radiate and anchor these energies into your being and reality. This means that the energies are not only flowing into your being through your soul and attunement with the Creator but are also flowing into your reality as a magnification through your crystals. This makes your sacred space extremely abundant in the Creator's present energies, allowing for a greater experience of the shifts occurring at this time. 3. Love Yourself More Each Day - Your unconditional love for yourself is paramount at this time because it is your security, your safe haven, your healing balm and your ability to recognise the truth of the Creator. Even if you are unable to currently feel or sense your unconditional love for yourself by simply believing and affirming in your mind that you love yourself unconditionally will allow for the activation of your ever flowing unconditional love from within your being. 4. Sharing with Self-Understanding - We are currently moving through a process of dissolving separation and accepting unity, whether it is unity between each part of our being, unity with the Creator or unity with other beings / humanity. It is wonderful to share and radiate our energies, light and consciousness while also sharing verbally and energetically the truth of our beings. With challenges and the need for releasing old energies this process can be achieved at a quicker rate by sharing your thoughts or feelings with another, a guide or even with yourself as you say it out loud to yourself. While this is extremely beneficial as it allows everyone to be of service in numerous ways there is a need to be conscious of what you are sharing. My meaning is that if you are experiencing suffering and you share your suffering with another person, there is a need for you to be observant of your sharing, being aware that the suffering is coming from your ego. I wish for you to share and I do not wish for you to control or limit your sharing but be alert as to the entire process and what you are feeling, where it is coming from. Even in your sharing acknowledge that it is your ego speaking or your truth speaking, be aware what part of your being you are feeling and experiencing as you will find that this allows you to detach and bring greater enlightenment forward. 5. Ensure You Are Supported By Your Guides - Your guides have a powerful role to play in your ascension at this time, they have much to share with you and much energy to support you. They will not assist you in this way unless you ask them to so please allow yourself to ask for the support and divine intervention of your guides to advance your ascension daily. 6. Enjoy and Be Grateful - Now is the time to enjoy every moment and to be grateful for every moment, remember that you chose to be on the Earth now so enjoy even the hardest of experiences and be grateful for everything that you choose, create and experience. Express your gratitude daily in order to awaken humanity's consciousness to the divine quality of gratitude and the state of awareness that gratitude moves you into. 7. Let Go Of All That You Can - To let go is to dissolve attachment, this doesn't mean that an object, friendship or mind state needs to be discarded but that it no longer has an emotional or mental hold upon you, you are able to love what was the attachment which can sometimes mean that you feel a greater connection but also a greater freedom between you and that which you let go of. In truth you are setting yourself free. By simply exhaling deeply and stating or holding the intention of letting go of whatever you are focused upon, a greater freedom can be experienced. My words may seem like spiritual common sense to you but they are simply an encouragement to support you at this most sacred time. Please know that I am here to love and assist you always.